The Jewish Montessori offers a flexible Extended Care Program. The children participating in this program enjoy supervised activities, arts and crafts and free play. 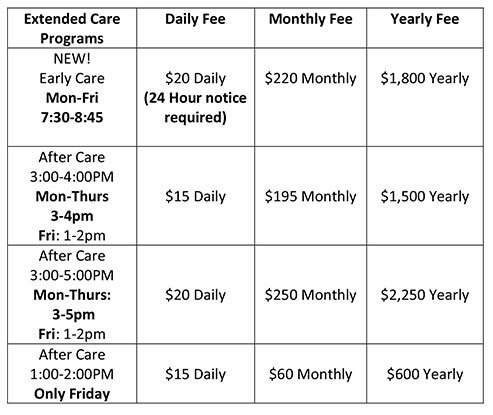 Our Extended Care Program is available Monday through Thursday from 3:00-4:00pm or 3:00-5:00pm and Friday from 1:00-2:00pm. We are now offering a NEW! Early Care Program, available 7:30-8:45am, Monday through Friday. The Extended Care Program has limited space, and we will be giving priority to families with yearly and monthly commitments. For same day notification for after care, please make sure to call the office for availability before 2:00pm, and for early care, please notify the office 24 hours in advance. Late fee: Please be advised that the late-fee for parents failing to pick up their child on time is $15 for every 5-minute increment. Carpool: There will be a Carpool option during Extended-care program from 3:50-4:00 pm and then from 4:50pm-5:00pm. In between these times please come get your child through the front door.